Nearly every single thoughtful critique (including pretty much everything I’ve written) of the Colorado Rockies upcoming season focuses on the same issue: Pitching – starters and the bullpen. That’s because the health and effectiveness of the Rockies who take the mound this season is in fact the critical element to any level of sustained success this team hopes to have in 2015 and beyond. 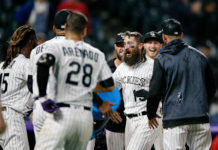 The Rockies feature an everyday lineup that takes a backseat to very few in baseball, and that includes National League West rivals in Los Angeles, San Diego and San Francisco. If they make it through springs training unscathed, Colorado will roll out Gold Glove winners in right field, at second base, third base and shortstop. They have four players that have been in recent All-Star games and the defending NL batting champion. 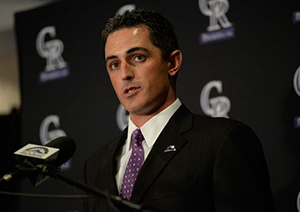 In 2014, the Rockies led the league in team batting average. Not too shabby. Still, pitching is not the only issue this team needs to address this spring. They must also figure out how this highly touted everyday lineup can successfully take its show on the road. The road is where Rockies pitchers get a break from the harsh conditions of Coors Field, but it’s also where the offense grinds to a screeching halt far too often. 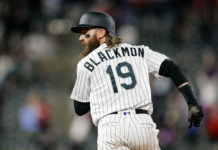 For all the spectacular numbers the Rockies put up in the friendly, altitude-enhanced confines at 20th and Blake, they often appear to have brought a rolled up newspaper to home plate instead of a piece of lumber on the road. This is nothing new. In fact, it’s been a bugaboo for the franchise for two decades. The Rockies brain trust is pretty much constantly in search of an answer. They’ve taken to using special pitching machines and the like during road trips in search of a solution to the nagging questions: Why can’t they produce on the road in a manner that at least resembles what they are able to do at home? Perhaps the solution is to look at the situation in reverse. Perhaps the problem isn’t not being able to duplicate on the road what they do at Coors Field, but instead how they can find a solid approach to hitting on the road that they can also employ while at home in order to make both better. Most of the time at Coors Field, guys step into the batter’s box looking to drive the ball into the gaps or over the fence. Home is where they pad their stats and put up big numbers. You know, because chicks dig the long ball. Perhaps if they walked to home plate at Coors Field thinking more about simply making solid contact and driving the ball to opposite field, or moving runners over via a bunt or hit and run, or simply trying to draw a walk to prolong an inning – you know, the way teams most often times approach offense in other venues – they could find some consistency between home and road. What if they were taught to think about manufacturing runs all the time? If they did it this way at home, the adjustment they need to make playing on the road might not seem so big. In 1987, I began the season as a member of a Denver Zephyrs triple-A team that set offensive records playing home games at Mile High Stadium. In my first start that April – my debut in my hometown – I had a 10-0 lead when I took the mound for the second inning. That Denver team featured four guys that hit more than 30 home runs that season. And while the manager, Terry Bevington, was not a well-liked guy (many of us would have gladly paid for his one-way ticket to anywhere), he proved to be a shrewd offensive strategist. Bevington’s plan was simple: Play the same “small-ball” strategy on the road and at home. He would try to manufacture runs regardless of the venue. That meant bunting, putting on hit-and-run plays and stealing bases as the staple of the offense regardless of whether or not the ball might end up in the seats. Bevington’s teams did not sit back and wait for the other team’s pitcher to make a mistake. He forced the issue every time he got someone on base. And guess what? More often than not, the approach caused opposing pitchers to make that very mistake. Our leadoff hitter, Billy Bates, led the league in stolen bases. He was running almost every time he reached base. It just so happened that often times after he stole second, he ended up trotting home. That was a terrific byproduct, but most importantly, this approach proved to be “altitude proof.” That Zephyrs team scored runs in bunches at home and on the road on the way to an American Association championship. Nothing is certain, and perhaps the difference in the way the ball travels and moves when it reaches home plate does make it just too difficult to simply put the ball in play in places like Miami and San Diego. On the other hand, if the Rockies hitters approached all their at-bats with the same “just make solid contact” approach, they’d end up with singles on the road, and maybe some doubles and triples at home. Remember, back in the days of the Blake Street Bombers, Colorado’s Eric Young was at the top of the order stealing bases and causing havoc. Forcing the issue worked for that team – Colorado’s first playoff team – 20 years ago. So while pitching remains the first, second and third most important factors going into this Rockies season, learning how to produce offense on the road – maybe by going small at home and away – will play a big role, too.